The great thing about using a CMS like Squiz Matrix is its flexibility. So when we decided to build a Pacific Union College iOS app it was a snap to get Matrix working as the datasource. I decided to use XML to provide the data (primarily from asset listings), but first I needed to do some proper setup and gather the tools that I would need. The reason I didn't use JSON was, in Squiz Matrix it isn't always possible to create valid JSON, which means removing the trailing comma on a listing. It is possible on asset listings, but not on things like a Calendar Page, which was essential to our app. For most of the tabs in the Pacific Union College app an asset listing is used. When I started looking for an XML parser I was overwhelmed by the number of articles and blog posts about which parser was the best. There were comparisons between NSXMLParser and libxml2, as well as many people talking about KissXML. All of these were fair solutions that would work well, but I wanted something very lightweight that was easy to use. After searching around a bit, I found XML Reader by Troy Brant. It was a very simple XML Parser that turned the parsed xml into an NSDictionary object which is exactly what I wanted. Once the parser spit out the NSDictionary I simply needed to loop through it in order to get the data that I wanted. Caching on the device is another thing that needs to be considered if your datasource comes from some URL. If users don't have an internet connection they still want to browse the app. 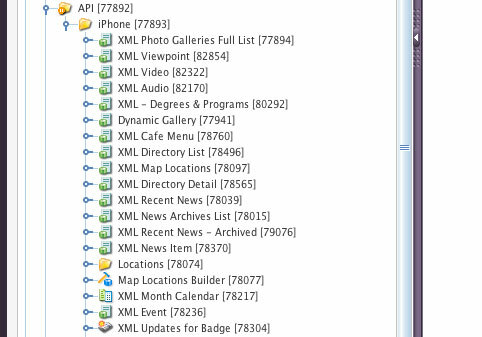 For the Pacific Union College app we cache all datasource XML files and use those files if the user is offline.